At 12:56 p.m. today, an email appeared in my inbox. I could not make heads or tails of it, but resolved to be a “team player” and figure it out without anyone’s help, including Google. 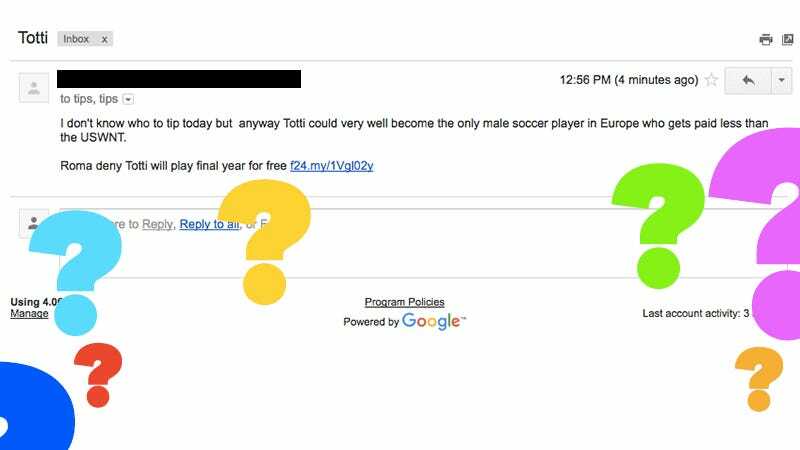 The email states that a male soccer player in Europe named “Totti” could get paid less than the “USWNT.” It ends with a striking fragment—“Roma deny Totti will play final year for free”—accompanied by a shortened link that I did not click on. Who is Totti? We know that he is a man, and we know that he is from Europe. We also know that he plays soccer, and apparently, that he is not getting paid enough money. It seems to me like anyone who has the nickname “Totti” is either a fun and easygoing alcoholic or a grandparent, so I’ll keep those two possibilities in mind moving forward. What is the USWNT? Upon first glance, it would seem like “USWNT” is a typo, or a shortened version of the line of gibberish I might type to one of my coworkers in Slack to express shock or amusement. Assuming it is not a typo or gibberish, it appears likely to me that our tipper is referring to the U.S. women’s soccer team, because they essentially get paid in ponytail holders, as far as I know; in that case, however, shouldn’t there be another ‘S’ in there? What is Roma? The Romani people (Roma in the Romani language), sometimes known as “gypsies,” are a historically nomadic ethnic group who now live mostly in Europe, although TLC’s My Big Fat Gypsy Wedding also had an American spinoff. They have been heavily persecuted throughout history, and that discrimination continues today. Many famous flamenco dancers were of Romani origin, including the legendary Carmen Amaya; Romani and Flamenco music are closely intertwined. What their problem is with Totti, exactly, remains to be seen. Why would Totti play soccer for free? Is he sick, and this is his last chance ever to get on that field and kick balls? Did he kill someone, and the Roma know? Does he think that if he plays for free this year, it will be somehow worth it in terms of exposure and learning experience? At this point, I just don’t know if I can speculate. Conclusion: Facts are few and far between here, folks. But if I were to make an educated guess as to what my tip was referring to, it’s this: a spunky and possibly murderous grandfather, nicknamed “Totti,” is being blackmailed into playing soccer for free. This is embarrassing for Totti, as he will be making less even than members of the United States Women’s Nerf Tournament. Read more about Totti here; I certainly won’t.